Hagerstown, Md. — To transport gas from the fracking wells in Pennsylvania and Ohio to the Eastern Panhandle, Columbia Gas, a subsidiary of TransCanada, needs to drill under the Potomac at Hancock, Md. But if things go wrong, it could mean disaster for the river and all who depend on it. “This pipeline may only be less than five miles long, but it is a senseless pipeline carrying fracked gas that poses a number of risks to our water, to our property, to our health and quality of life,” Upper Potomac Riverkeeper Brent Walls said today outside the office of the Chesapeake & Ohio Canal National Historical Park in Hagerstown, Md. The C&O Canal, managed by the National Park Service, runs 185 miles along the Potomac, so if Columbia wants to lay pipeline across the river, it also has to cross the C&O Canal. There might be five pipelines already spanning the Potomac, but the pipeline Columbia Gas wants to build is different, according to Walls. The underground terrain of the region, which is prone to sinkholes and subsurface cave-ins, makes laying pipeline here a more dangerous proposition than elsewhere. Leaks and explosions are more likely to occur when terrain is unstable. But it’s also how Columbia Gas wants to lay pipeline under the river that is a concern, by using a method called horizontal direct drilling (HDD). With HDD, huge amounts of drilling fluid are used to lubricate drill bits, sometimes millions of gallons. When inadvertent returns or “blowouts” occur, the drilling fluid is expelled back out of the bore hole. A blowout during HDD of an Energy Transfer Partners pipeline in Ohio in April 2017 resulted in 2.1 million gallons of drilling fluid spilled into wetlands, for example. In karst geology, drilling fluid could potentially enter aquifers and contaminate the groundwater. Maryland, West Virginia, Pennsylvania and federal agency FERC have all approved permits for the pipeline, but the National Park Service (NPS) has yet to grant a right-of-way permit. It can still say no, Walls says. Columbia Gas’ Potomac Pipeline would connect with the Mountaineer Gas Pipeline in West Virginia, now under construction, with a proposed extension into Jefferson County. The new supply of gas is intended to go to a contested industrial park in Jefferson County, where the Rockwool insulation fiber factory is facing heavy opposition. Tracy Cannon of Eastern Panhandle Protectors pointed out that if Rockwool is forced out of Jefferson County and never completed, then there is no purpose for the pipeline. “if the Park Service holds firm, then there’s no source of gas for the [Mountaineer Gas] pipeline, no houses to blow up in Hedgesville, no gas to serve the highly polluting Rockwool facility,” she said. 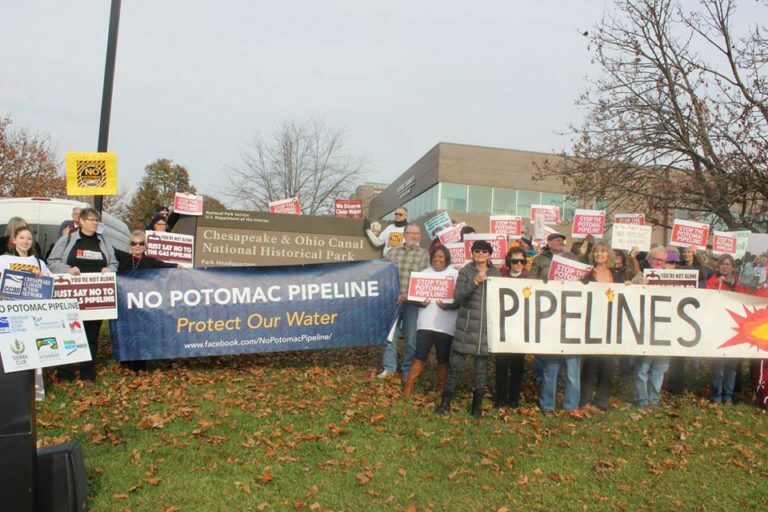 Potomac Riverkeeper Network, Eastern Panhandle Protectors and Chesapeake Climate Action Network delivered 8,000 petition signatures to NPS asking it to deny the right-of-way permit.